Age-related macular degeneration (AMD) is the primary cause of sight loss in the western world in patients aged over fifty. More than 25 million people currently suffer from this illness in the world, with an additional 500,000 every year, approximately. There are many subtypes of AMD but basically two broad forms: wet or exudative and dry or atrophic. Dry AMD makes up 85 % of all cases of age-related macular degeneration. Although it is much more frequent and the visual disability it produces is very serious, it is erroneously believed to be more benevolent than wet AMD as it has a slower progression over the years. What are the effects of dry or atrophic AMD? In this kind of macular degeneration, the loss of visual acuity is slower, therefore providing apparently good central vision. In the case of reading, although patients may not have a problem in seeing each letter independently, they cannot see the following or preceding letters. They cannot put the letters together and, consequently, cannot read. A thorough ophthalmological examination is required, including a retina scan, autofluorescence, optical coherence tomography and, in some cases, microperimetry and visual field campimetry tests. 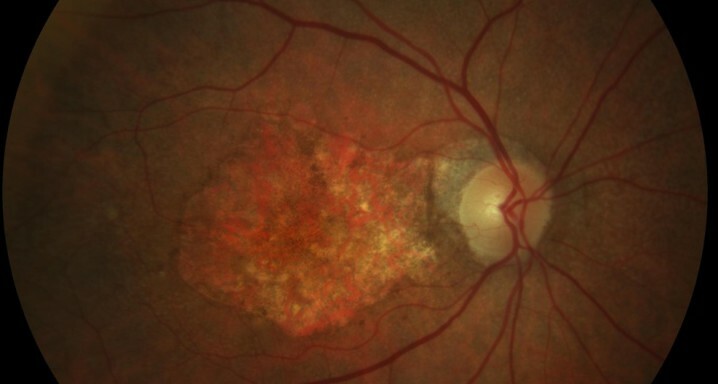 After significant advances achieved in controlling the exudative form of AMD, the great challenge facing researchers is to find a treatment that can halt the relentless progression of the atrophic forms of this illness, together with others than can restore or regenerate the retina that has disappeared or been destroyed. There is currently no treatment for atrophic AMD, although the research being carried out worldwide is very intense and promising. In this respect, the Institut de la Màcula collaborates closely with the Barcelona Macula Foundation: Research for Vision, a foundation specialising exclusively in research into retinal illnesses that cause blindness. The aim of this collaboration is to find solutions and treatments for those illnesses that are still incurable and cause blindness. —A healthy diet, rich in fruit and vegetables and low in animal fat.